Wade won the World Championship final round on a single pass after fellow competitor Jared Jones broke during the burnout and was shut off. Moody ran 6.974 at 198.04 mph in the final round of competition. 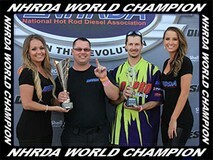 Wade drove all over the country this season, in his final trip back to Maryland he will be carrying both the World Championship and Points Championship Trophies for the year.